Some posts take longer to write. That’s how it was with these capitolios – vanilla cupcakes topped with meringue, dipped in chocolate, and shaped like Havana’s Capitol building (hence the name). Our parents used to buy them for my sister and I and for years she’d been asking me to make them. Since her birthday falls in May, she always plans something outside and this year she chose a spot under the Brooklyn Bridge and next to Jane’s Carousel for a picnic. I had no idea what to bring when she reminded me that I’d never gotten around to the capitolios. I’d partly put it off because I only had a fading memory to go on. Some Cuban bakeries in Miami still make them, but too often I get blank looks when I ask or get there just after they’re sold out. 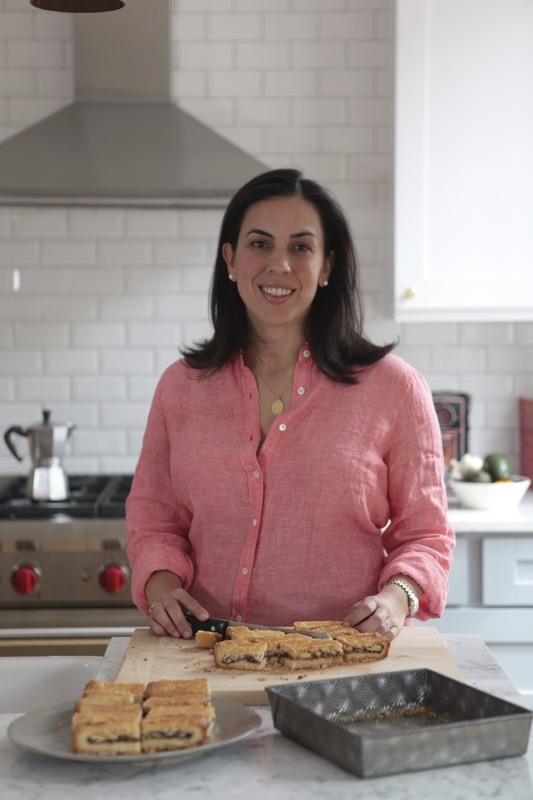 Now entering the final stages of a long project, I’ve started a second book – this time focusing on Cuban desserts so there was no better time. I also knew even a imperfect attempt in this case, would still be the perfect gift so I got on with it . Adapting a Cuban layer cake for the cupcakes, I dug out a chocolate glaze recipe. I frosted the cupcakes with meringue and let them set in the freezer so they’d be as cold as possible when they went in for the dip. Finishing the last ones just before heading over to DUMBO, I could barely wait for them to set before I tried one. Just like the ones I remembered, they can only be attacked from the top leaving you with a face full of meringue like it’s your first birthday all over again. That at least I got right. 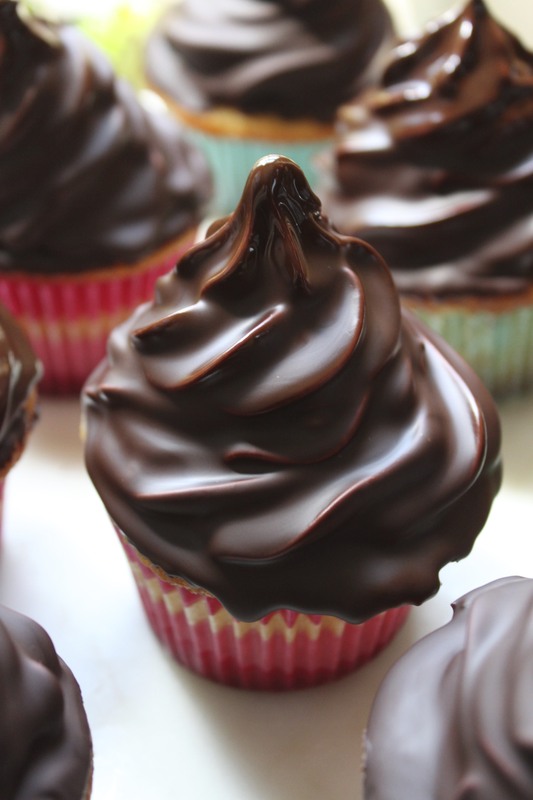 The cupcakes can be made ahead and frozen well-wrapped before frosting and glazing. Keep cold until set and ready to serve. Preheat the oven to 350º F. Lightly spray the muffin pan with oil and line with cupcake liners. Set aside. Sift together the flour, baking powder, and salt in a medium mixing bowl and set aside. In a stand mixer fitted with the paddle attachment, beat the butter and sugar on medium speed until pale and fluffy, about 5 minutes. Add the eggs one at a time, beating for about 30 seconds after each addition. In a small measuring cup, combine the milk and vanilla. On low speed or by hand, add the flour mixture to the sugar-and-butter mixture in three batches, alternating with the milk and ending with the flour. Do not overmix. Pour the batter into the prepared muffin pan. Set in the preheated oven and bake until lightly golden and a tester comes out clean, 25 to 30 minutes. Remove from the oven and allow to rest in the pans for 10 minutes before un-molding. Allow to cool completely before covering. Prepare the meringue. Combine the sugar and water in a saucepan and bring to a boil. Simmer over medium-heat until it reaches the thread stage and registers 230ºF on a candy thermometer, 10 to 15 minutes. In a stand mixer fitted with the whisk attachment, beat the egg whites on low speed until foamy, about a minute. Add the cream of tartar and increase the speed to medium until they hold soft peaks. Add the syrup, a little at a time, and beat on high speed until it forms stiff, glossy peaks. Using a pastry bag fitted with a star tip, pipe the cupcakes with the meringue to form a dome or cone shape. 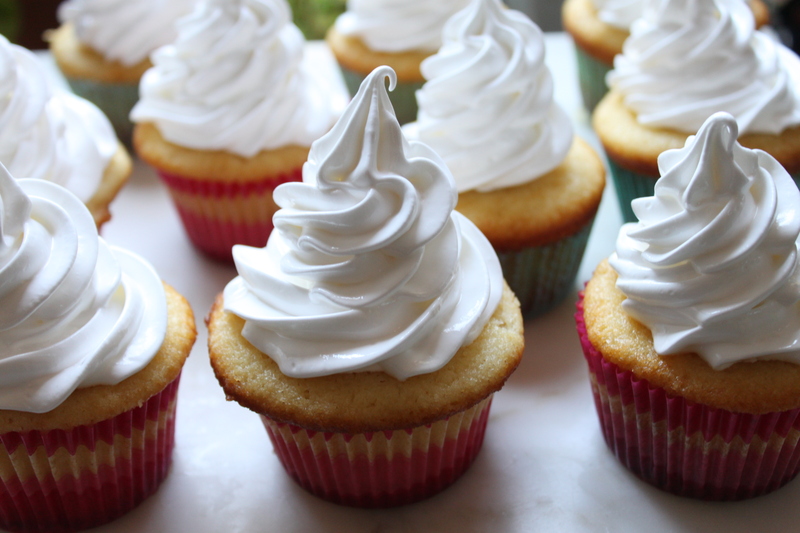 Chill the frosted cupcakes in the freezer while you prepare the glaze , 10 to 15 minutes. 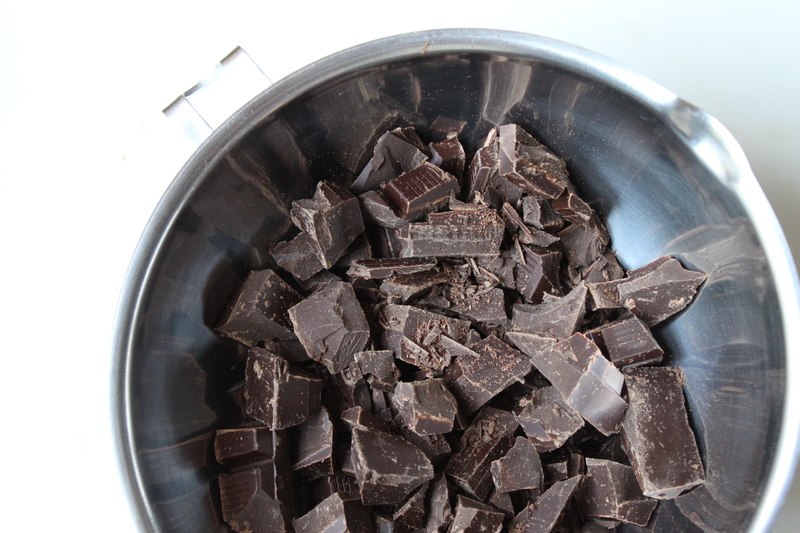 Place chocolate in a double boiler or heatproof bowl over simmering water and stir until melted. Off heat, slowly add grapeseed oil until the chocolate is completely blended. Pour the melted chocolate into a 2-cup measuring cup. 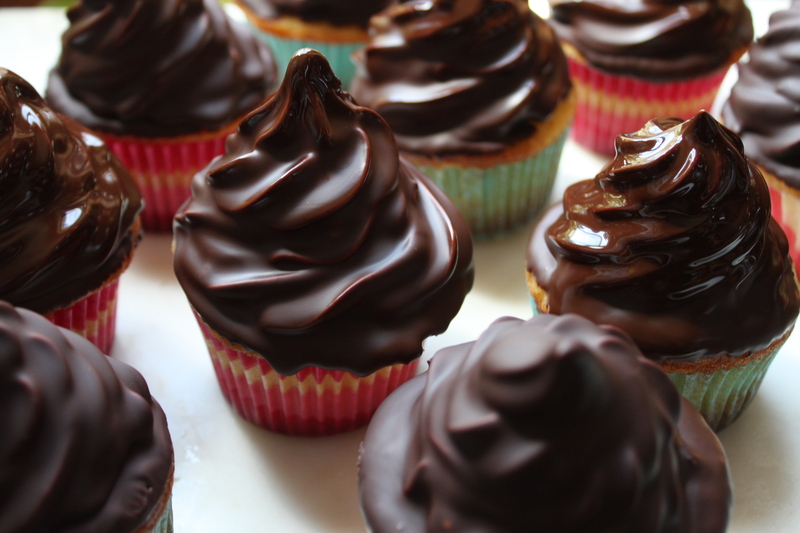 Holding each cupcake from the bottom, dip them in the chocolate glaze until they are well covered, allowing the excess to drip off. If the chocolate becomes firm, rewarm over simmering water or in the microwave for a few seconds until silky. Set the cupcakes upright on a baking sheet or rack lined with parchment paper. Freeze until the coating is set, at least 10 to 15 minutes. Makes 12 to 14 cupcakes. una verdadera delicia, tendré que intentar esta delicia…. My birthday is Oct. 26!!!!!!!!! I’ll make them for Christmas then! What an amazing cupcake—-I pinned it immediately. To think this is part of your growing up and I have been totally in the dark about their existence. Isn’t it fun to ‘meet’. The pic of the restaurant with the cherries blossoms in that light was such an appealing photo. I was disappointed that I couldn’t walk in and sit down. This reminds me of a chocolate dipped ice cream cone I used to get as a kid. 🙂 Looks delicious! Wow these look incredible! I agree with the comment above by Brooke about these looking like chocolate dipped ice cream cones I loved as a kid (and still do)! A mild flavored oil like canola would also work. Quick question, do you pour the warm syrup into the meringue in the mixer? Is that what cooks the meringue? I follow a low carb diet and was thinking of making just the meringue part with Splenda and then dipping into a low carb chocolate glaze that I use, but wasn’t sure at what point the meringue is cooked?